We’re in the midst of a busy busy week… Our Fall stock is starting to arrive, our 6th Anniversary Sale is coming up, and we have a few fun summer events to squeeze in before September arrives! Our 6th annual Anniversary Sale to celebrate the store’s opening will be held August 22nd, 23rd and 24th from 11am-6pm. We’ve added Monday to the sale weekend to include any weekend warriors who wish to stock up on their Fall knitting needs. Almost half of all store stock will be on sale from 15% to 60% off, so be sure to stop by! We’ll also post a list of the sale items on our blog page a few days prior so check back! Sign up to join SOCK SNIPER 2015. Read the rules here, sign up by August 24th, chat with us on the Baaad Anna’s Ravelry group and I will award a skein of free yarn to the last man/woman standing from the Lower Mainland or BC-area (see the Sock Sniper thread in our Ravelry group for full details). The rules look complicated but are deceptively simple: Knit socks, get a pair of socks and try to be the ‘last man standing’ in a wink-murder style sock knitting contest. All funds raised through entrance fees support Doctors Without Borders, and there are many more skeins of yarn to win through the organizers of this Ravelry-based game. Join, play and win! Enter all, enter often and have a chance to win all three skeins! 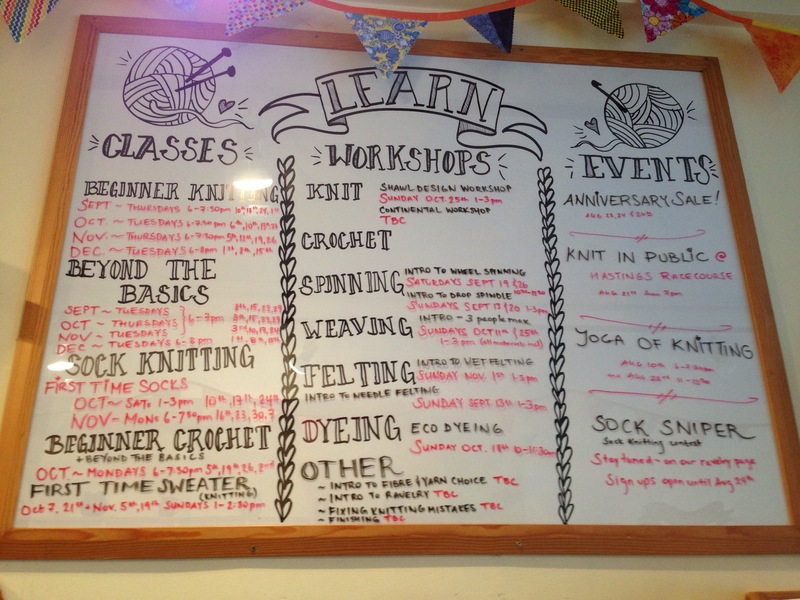 Come learn with us… beginner knit, crochet, weaving, wheel and drop spinning, as well as many internediate and advanced classes and workshops available in the Fall. check out our website fir the full list and details. Our Fall class and workshop schedule is now updated online, and many are are already filling up fast. Lots of great teachers, guests and new skills to learn! Lastly, come join us for an evening at the Hastings Racecourse on Friday August 21st. A group of us will be doing some knitting/crocheting/felting-in-public and enjoying the warm summer night; bring a blanket, your current project and join us on the grass just west of the west entrance from 7pm. Free of charge; additional info on the Hastings Racecourse can be found here. If it’s raining, look for us on the west end of the covered bleachers. PS… Our Wednesday Knit Night will still occur next week in addition to this Knit In Public event… And for those who know our Nicola, she will be stitching and bitching along with us that night! 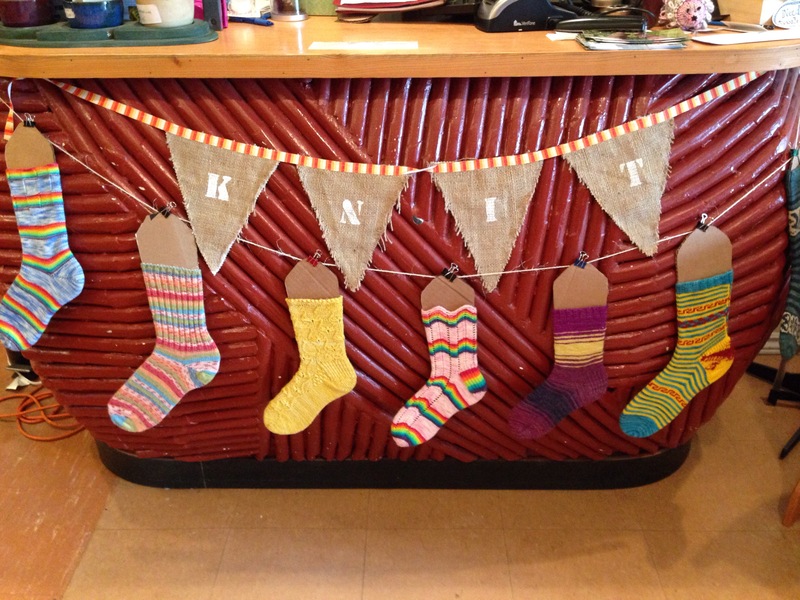 ← Pop Up Sale – All NORO!